Destiny 2 moves away from the mythology surrounding The Darkness laid out in the first game and its expansions. The closest thing you’ll seen to The Darkness are The Hive, who worship it, but are not part of it. The Darkness mythology will return in later installments in the series but for now it’s taking a back seat. Instead, the main threat in the sequel is Dominus Ghaul and his Red Legion. The Legion is a faction of the Cabal, a militaristic alien race who are pretty mad by how badly we beat up their compatriots in the original. Here’s everything we know about Destiny 2 PC’s release date, changes and more. The Cabal were the least fleshed out of the alien races in the original. Bungie have used Destiny 2 to remedy that, letting us discover their history, how they’re structured, and who their biggest personalities are. 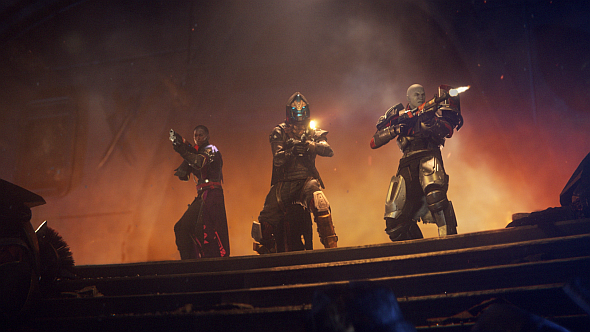 Ghaul and his Legion are central to that, and when we join him, we find he’s responding to a distress call sent to the Cabal Emperor during a mission in Destiny’s Taken King expansion. But it turns out Ghaul has a second, much more interesting motive – he’s grown up to believe that he and the Red Legion should have received the Traveller’s power, and it made the wrong choice by choosing us. We get to know more about Ghaul’s past, and how he arrived at this opinion, through his interactions with his mentor, who is known only as the Consul. The Consul acts a guiding voice and a coach to Ghaul. He even advised Ghaul to stage a military coup against the previous Cabal Emperor, named Calus, unseating him from power before dooming him to exile. The City falls – along with the loss of all your loot – and the Guardians are scattered to the winds. The first place you end up after fleeing the City is the European Dead Zone on Earth. We saw glimpses of this in Crucible maps in the original, but this is the first time we get to see it in PvE. Bungie say it’s the biggest place they’ve built “by a factor of two”, and it features a big new social hub where many refugees from the Tower have wound up. Eventually though, you go further. There are three other planets in the sequel: Nessus, Io, and Titan. Each of the Vanguard’s three class mentors has wound up there for some personal reason: Nathan Fillion’s Cayde-6, the Hunter mentor, has run off to try and play the hero on Nessus and gotten captured, so you should rescue him. Titan and Vanguard leader, Commander Zavala, has suffered an existential crisis and fled to Titan to sulk. The Warlock, Ikora Rey, has run off to Io, the last place the Traveller’s Light touched in the solar system. 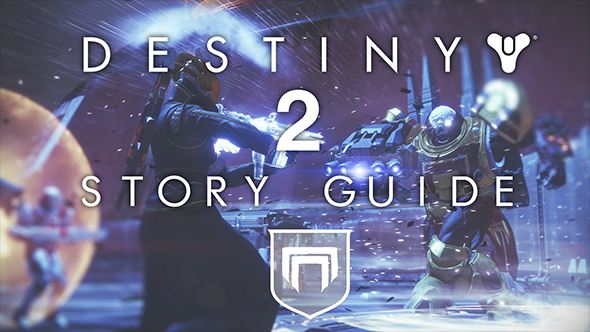 For more on those planets and what you’ll do there, check out our Destiny 2 planets guide. And that sets the pattern for Destiny 2’s campaign: linking up with the rest of the Vanguard (“getting the band back together”, in Bungie’s words) getting your powers back, and, eventually, taking back your home. That’s all the story in the main campaign, but looking further ahead, we can glean some clues from the Destiny 2 expansion pass. As you can see from its listing on theMicrosoft store, it contains two expansions, each marked by a symbol. The golden eye represents Osiris, while the blue winged diamond represents Rasputin. These are outlying figures in Destiny lore that cast a huge shadow despite being relatively under-explored in the first game, so this hint that we’ll see more of them is pretty exciting. If you’d like to catch up on more of Destiny’s lore, check out ourprimer.